When you’re looking for the best conference apps or event apps it’s easy to get lost in a sea of possibilities. The landscape of providers and features is varied, and seems to always be in a continuous state of flux. It’s exciting for buyers because it means unprecedented innovation, but it’s also becoming easier and easier to lose sight of the things that really matter when choosing the best event app. When we say “event app,” we’re usually discussing a basic set of non-negotiable features that make up any product. You want an app that will help guide your attendees around the event, pick their agendas, get important updates from the organizers, network with other attendees, and provide feedback. Starting there will help you narrow down the best conference apps and event apps. How easy is it to create an app? Will it work for my attendees both online and offline? Will attendees know how to use it to successfully navigate my event? Can I make last-minute changes and publish them immediately? We’ve created a chart to help you quickly narrow the choices when it comes to event apps and conference apps based on a few key distinguishing features. The above is based on a reasonable amount of research on our part from providers’ feature listings and conversations with clients. Not all providers publish their pricing (a pretty shady tactic, we think), so we grouped them based on the cost of their average event app or conference app. $ is $0-$6,000; $$ is $6,000 and above. Please note that individual offers to clients can vary widely. Depending on the nature of your information, you may need your app to be under lock and key. There are several levels of enterprise security these days: whitelisting, SSO, and MDM. Make sure your app provider offers different options to suit your security needs. Building an event app requires some time commitment. Before you decide to invest in an event app builder, test the technology and make sure you are comfortable using it. If the provider doesn’t allow you to try the product pre-purchase, that should raise concerns about the solution’s ease of use. One way to build an event app quickly is to divvy up and delegate the work so you don’t have to enter all the information. 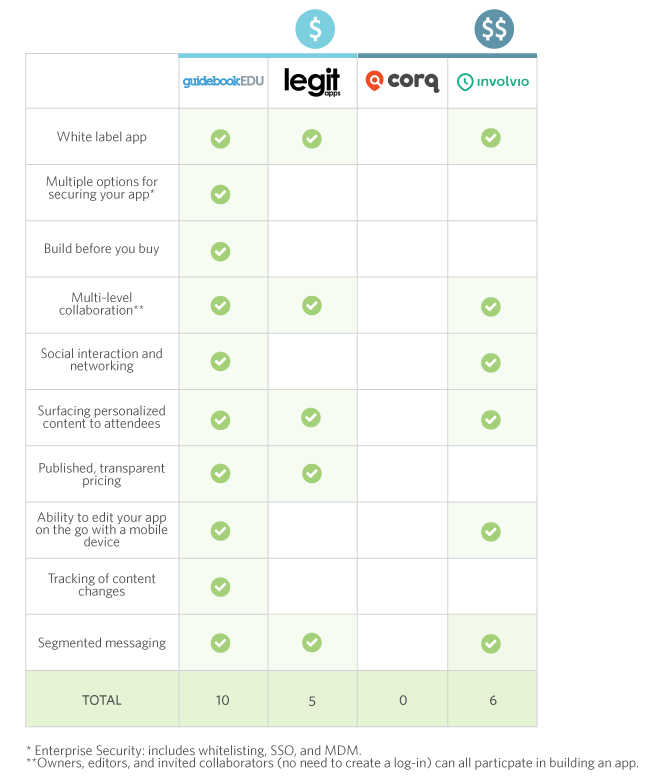 With some app providers, collaboration features are limited or require an additional charge. Having multiple editors on your app, and varying levels of privileges for them, will allow you to work quickly and efficiently. **Owners, Editors, and invited collaborators (no need to create a log-in) can all participate in building an app. Networking is one of the top reasons people attend events. Make it easy for attendees to create new connections and get the highest possible ROI out of your event. If your event app encourages social sharing and links to existing social media accounts, your users will use the app more frequently. Some event app platforms have the ability to curate a unique experience for each attendee, increasing their perceived value from the app. In our experience, apps with personalized content have a significantly higher engagement rate from their attendees. Let’s be honest, there are plenty of app providers out there. When comparing providers, check to make sure they are clear and upfront about their pricing. Rather than wasting your time with demos of overpriced apps, consider providers who are transparent with their pricing model. They say you get what you pay for, and if you don’t even know what to expect to pay, what does that say about the event app you’re getting? Things at your event change at a moment’s notice and you don’t always have a computer available. Check to see if you can make edits and adjustments to your app right from your phone. As you build your app and have multiple people contributing content, someone might make a mistake or fall behind on their assignments in the building process. Revision history is an excellent way to keep everyone on schedule and track the changes that have been made. Typically you have different groups or categories of attendees at your event. Rather than spam all of your attendees with messaging that is only relevant to a small portion of users, you can target them. Segmented messaging features allow you to send a message to a single attendee or all the people attending a specific session. Features and functionality previously mentioned in this post including native apps that function offline, live polling, customizable icons and colors, session attendance limiting, and drag and drop editing have now all become standard event app features. While it is important to make sure your provider offers these abilities, it is more likely than not that they have this functionality. so we chose to focus on more recent must have innovations from event app providers. If other providers don’t satisfy these requirements, that’s an immediate red flag. Different companies structure their prices in different ways. Unfortunately, most companies do not publish their pricing online, and it’s up to you to negotiate a good deal with them. This can often work against the consumer and lead to unexpected fees. Universities host very specific types of events such as open houses, campus tours, orientations, and more. At Guidebook, we understand how these event app features translate to the higher-ed space. 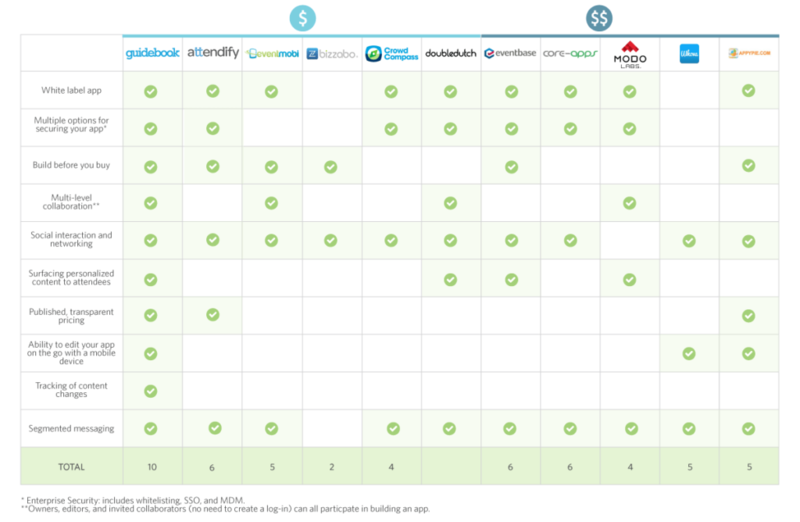 Here’s a chart to assist you in your search for event apps for universities. After you have narrowed your choices and demoed the products of your front-runners, the time will come to choose the best conference app or event app. Beyond a list of features and a quoted price there are several intangibles that should drive your decision. When you look at the app, is it visually appealing? Is navigation of the app self-evident? And can you truly brand the app to your own specifications? We find that users prefer a clean, simple and modern style when using an event app. The best event app is the one whose backend builder is easy to use, but also the app itself is easy to navigate for the end user. Is the app going to work regardless of your venue’s connectivity? Can the provider give you any guarantees about the app’s functionality? Find out now before it’s too late! Perhaps most important of all – will the provider be there when you need them most? Be sure it’s clear whether or not you’ll have a dedicated account manager and how to get a hold of someone if something isn’t going quite the way you planned. The best event app is the one that’s easy to set up and deploy, but also offers you real human support. Your satisfaction with the service is directly linked to the effectiveness of your app and the happiness of your users. Want to see us in action? Request a demo below to see how Guidebook can power your mobile app efforts!